Joy is defined as: “a feeling of great pleasure and happiness.” I realized the other day that food has been at the center of most joyful occasions for me. Whether it was during one of our family holiday parties, celebrating a birthday, or just a casual Friday evening, food remained a constant at all of it. I had every intention of making tacos for dinner one evening, not too long ago, and decided at last-minute it was too much work. To be fair, when we make tacos in the Jamieson household we go all out. Although it still would’ve been considered quick by timing standards, it would have been more effort than I cared to put in at the moment. It was then I decided to combine a bunch of ingredients in one pot which takes a lot less effort. Since I had already thawed out my ground turkey I decided whatever I was going to make was going to be along the lines of browned ground turkey and sautéed chopped onions. 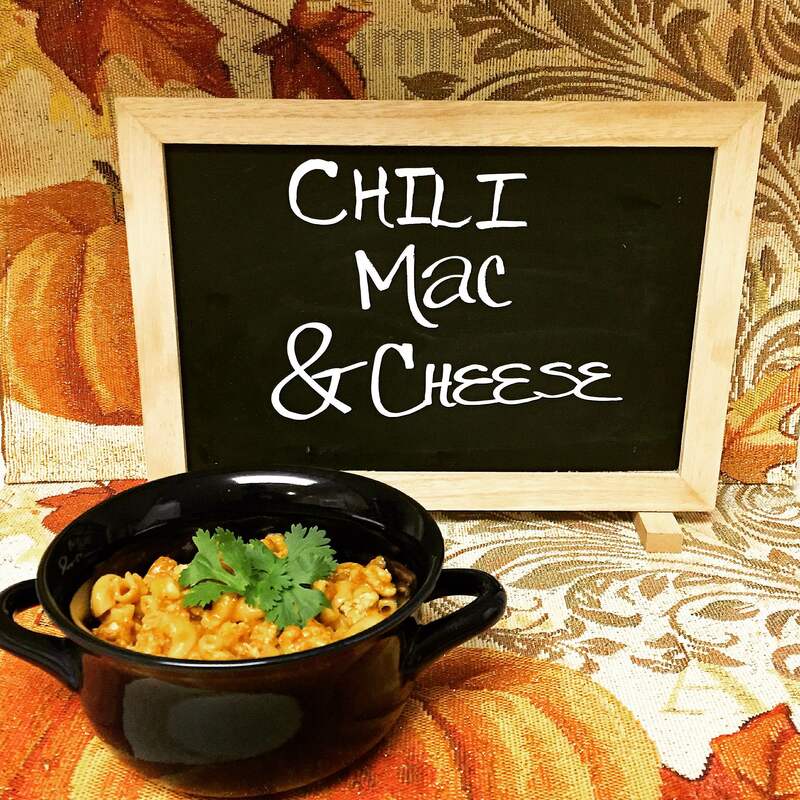 Once I was done combining the ingredients I found in my pantry and refrigerator I had a delicious chili mac and cheese dish right in front of me. This would be the second time I have whipped up a pretty impressive meal using the ingredients already in my house. Go me! 🙂 Now that I have made this recipe a second time, and according to my husband it was “just as amazing as the first time” it’s only right I share the deliciousness with all of you. On medium-high heat saute the onions for 3-4 minutes. Add a pinch of salt to help soften the onions. Now add your ground turkey to the deep skillet and stir until golden brown. Once your ground turkey has browned add your onion powder, black pepper (and adobo) seasoning to the ground turkey and onion combination. Mix the seasonings in and pour your beef broth into the skillet. Bring the skillet to a boil, stir in your taco seasoning and pasta. Let it boil for 5 minutes, then cover and turn the heat down to a low simmer. Let it simmer for 20-25 minutes or until the noodles are soft. If you want more salt and/or pepper in the dish add it now. Pour your cheddar cheese into the pot and mix it in until it has all melted and evenly distributed. Not only is the recipe easy, it is just as quick to throw together. Enjoy your meal because dinner is served! It is that time of year for deliciously warm comfort foods to stick to our bones and keep us warm. This is one of the many reasons why I love this season. 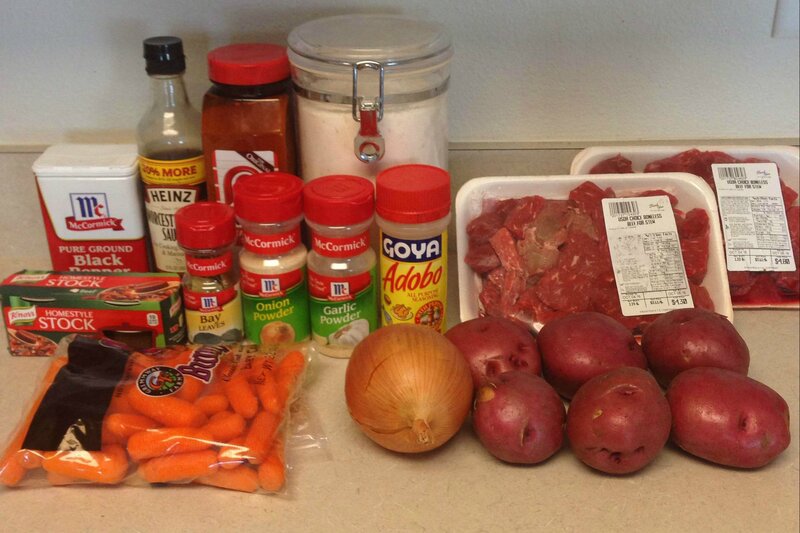 Today I am sharing my own yummy crock pot beef stew recipe with all of you. It takes a little bit of preparation, but I promise it is worth it! 1) Combine all of your stew beef flour seasoning in a large Ziploc bag and shake to mix together. Add your two pounds of stew beef to the bag and shake until the beef stew pieces are generously coated. Heat your first tablespoon of olive oil over medium high heat and wait for the oil to get hot. Add half of your beef stew meat to the pan (or however much will NOT overcrowd the pan) and brown on all sides. Repeat until all of the beef is browned and place your browned stew beef at the bottom of the crock pot. 2) In the same pot, saute your onions and place them on top of the browned beef stew meat. 4) In the same pot you used to brown you meat and saute your onions; on medium high heat combine the: water, Worcestershire sauce, beef flavored packs, and beef bouillon cubes until it all melts together. Once it has all melted pour it over all of the ingredients in the crock pot. 5) Add your bay leaves to the top and set your crock pot on high. Let your stew cook for at least 8 hours.